Caregivers of older adults have plenty to keep track of – appointments, physical therapy, medications, meals, and groceries. It can make flossing seem like the last thing to worry about. But maintaining a healthy mouth in older adults is key to being healthy overall. Comfort and self-esteem are also impacted by a healthy (or unhealthy) mouth. 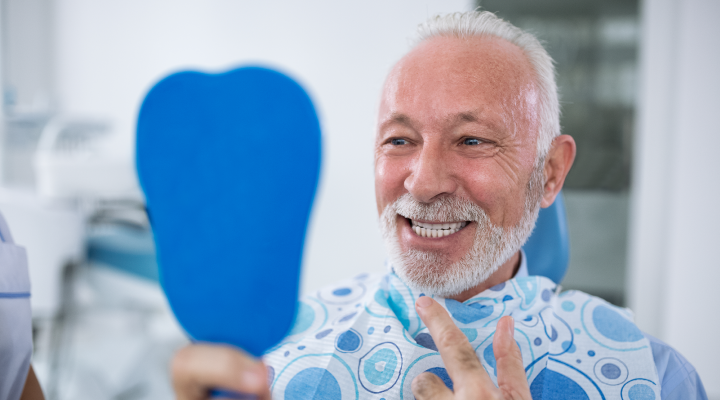 Our tips for a healthy mouth will help caregivers for older adults stay on top of smile care. Chewing problems and tooth loss often lead to older adults not consuming a proper diet. 21.9% of adults over 74 in the United States are toothless to some degree. Older adults with in-home care are at a higher risk of malnutrition. Avoid concerns about malnutrition with those you care for by creating a weekly meal plan with balanced plates. If tooth loss makes it difficult to consume enough fruits and vegetables, cooked and canned options are softer and can help. Unsweetened fruit, low-sodium soups, and canned tuna are great to keep on hand for quick meal options. Make blended vegetable soup a weekly staple for an easy meal that’s high in fiber, Vitamin A, antioxidants, and more. Brush teeth twice a day for two minutes. Clean between the teeth daily with floss or other between-the-teeth cleaners. If they have dry mouth, an alcohol-free mouth rinse may help. Sipping water, sucking (not chewing) on ice chips, and using a humidifier while sleeping can help keep him or her hydrated. Limit snacking and sugary drinks. Healthy foods and drinks such as fruits, vegetables, whole grains, and water are good for the mouth and the body. Make and keep dental appointments. Even people with dentures need to visit the dentist. Watch for symptoms that could signal larger issues by looking in their mouth after brushing and flossing. Rinse dentures after each meal. Brush them daily with denture cleaner and take them out before bedtime. Store in fresh water when not being worn. Caring for older adults is no easy matter. But with these tips for caregivers of older adults, you’ll be well on your way to making a healthy impact on their smile health and their overall health.